We’ve been seeing a lot of car parts (specifically brake rotors) coming in that are causing big issues to our process. Auto metal, fabric, glass or car plastics are NOT recyclable in the bin. These items need to be recycled separately by specialized processors. See end of post for options. Why? The single stream process is setup only for single stream items. When other items like car parts come in, our team members have to manually pull them out before they break our equipment or worse, hurt someone. 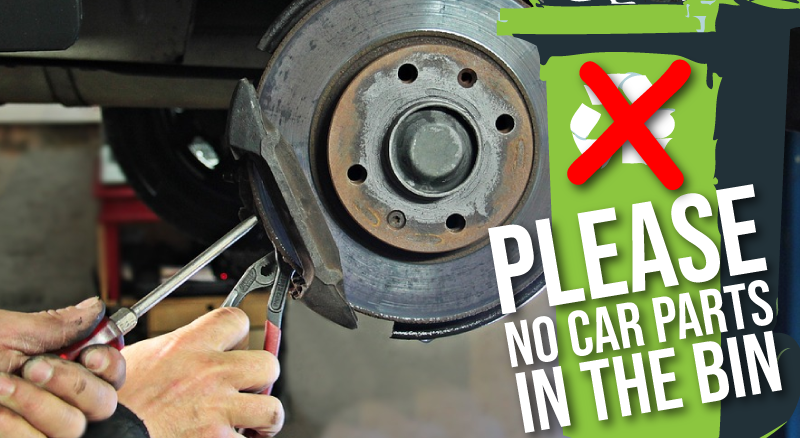 This job is not easy… please help our crew and think of them before tossing items in the bin. Although these can’t be recycled in your household recycling bin, there are options! Check with local scrap metal companies, the Sioux Falls Household Hazardous Waste Facility, and the Sioux Falls Regional Landfill on their recycling programs. Many of the items listed above can be handled separately at one of these locations. There are 0 comment. on "Car Parts Don’t Belong In the Bin"